Carrascal: new River Plate player The Colombian midfielder signed his contract with the Institution, on a 12-month loan with option to buy. Jorge Carrascal will join the professional team managed by Marcelo Gallardo. 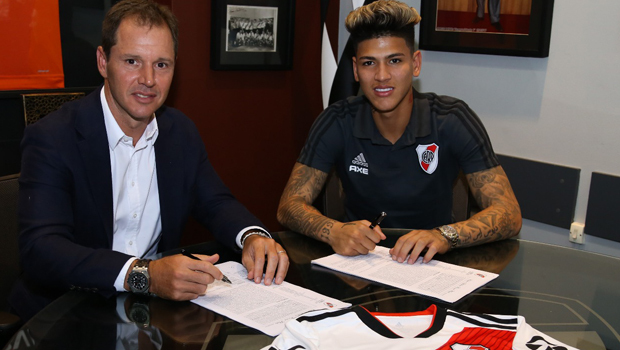 On Tuesday, January 29th, the Colombian player underwent the mandatory medical examination and, on Wednesday, he signed his contract with River Plate in the presence of Jorge Brito (1st Vicepresident). Carracal started his career in Bogota’s Millionarios in 2014. Then, he played in Spain’s Sevilla and in Ukraine’s Karpaty Lviv. In 2015, he played in the South American U-17 Championship, in Paraguay, for Colombia’s National Team: he played five matches and scored one goal. -Since his debut in Millionarios in November 2014, he has played 47 matches in top-flight teams. -Since he joined Karpaty, Carrascal was the team’s third top scorer in the Ukrainian Premier League, with six goals. Since his arrival, only five Karpaty players have played more matches than Carrascal (38) in the Ukrainian Premier League. -For Colombia, Carrascal participated in the 2015 South American U-17 Championship, where he played five matches and scored one goal.